Galaxy S4 Zoom has arrived in India at a price of Rs 29,900 and it got some really good things to talk about. For those who already know about the Galaxy S4 this device got nothing new in front but there is a big camera sensor at rear and a dedicated camera software too inside. Let see what device got in and how capable it is to let you think again over carrying a bulkier camera or a smartphone, the Galaxy S4 Zoom. As this is the major advantage of buying Galaxy S4 Zoom or we can also say it as major feature so let me start the specifications proceedings with camera section. Technically it got a 16MP camera at rear with sensor measuring ½.33” and a Xenon flash. It got up to 10x optical zoom which makes it look like a camera and also powered by optical image stabilization. Optical image stabilization let you take high quality still pictures when you’re not in position to take still pictures. For a camera it is very important that the photographer should remain still otherwise it’ll affect the quality but Samsung has used the OIS technology to take the picture quality high in that situation as well. As it’s not a complete camera so it’s a very handy feature to have. It comes with one more feature that really impressed me. The feature is known by Photo Suggest and as the name suggest it will suggest you the location of the photo to be taken. Yes, it’s really working! When you move into the feature then it will show you photographs taken by other photographers at different locations and it will also suggest you the best locations near you where you can capture beautiful scenes. This feature is really impressive (I must say) and it will really make the user happy. There is lots of pre defined scene mode too as every camera does have and Samsung call it Smart Mode. There is one more additional handy feature known the Drama Shot which allows taking multiple picture of a moving object and bind them into a single snap. There is face detection, smile detection, HDR, Panorama and the touch focus too. The 1.9MP camera is also there at front to let you take front facing pictures and record videos while doing video calling. 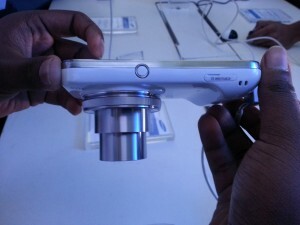 With this device, Samsung is trying to create a new era of smart cameras. Samsung has already launched two Android running cameras but they don’t seem to be much popular while this device seems better than both of them and its price tag will also help it to get lot of users. 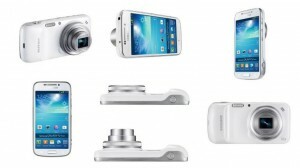 Now let’s start with the smartphone related specifications of the Galaxy S4 Zoom. For a user who travel a lot and like to use his/her smartphone as a camera more than any other feature than this device is really good for him. He/she doesn’t need to carry bulky camera on tour as the picture quality they will require will be delivered perfectly by the Galaxy S4 Zoom. No serious photographer will leave his camera for this device but few may also buy them for a reason. The reason is that in case the camera drop out the battery then they can use the Galaxy S4 Zoom and don’t forget it can also be used as a smartphone. Samsung Galaxy S4 Zoom will be available in stores from 15th July with attractive introductory offer where in customer would get a free flip cover. Do share your views down here in comments about this Smart camera phone.